Quick fixes for ISDone.dll Unarc.dll ISArcExtract download error happen during some Game installation. ISDone.dll It's not found ISArcExtract. ISDone.dll It is not found any file specified for ISArcExtract. ISDone.dll An error occurred while unpacking: archive corrupted! Unarc.dll returned an error code: 11 -7 12 -1 or -14. Error: archive data corrupted (decompression fails). ISDone.dll No results file specified for %s. ISDone.dll It is not found any file specified for IS7zipExtract. If any of the above error messages appears while you were installing a game, app or software, the fixes and solutions below would be of help and applicable to your problem. The error code and message may differs depending on what dll file is missing from your system file. It can happen in both 32-bit and 64-bit Windows system (Windows 10, Windows 8, Windows 8.1, Windows 7 and XP). Yes, you heard it right. Re-download your game setup before you start messing around with the system file. We suggested this because 9 out of 10 times a simple re-download fixed the error. The error will occur if your setup files are corrupted and that the setup isn’t able to extract the missing or corrupted file in the middle of the installation. Sometimes downloads can go wrong especially if you keep pausing and resuming the downloads. This can also happen if you are using some very nasty, messy and complicated downloader such as some random chinese downloaders. If you know about hash checking and how to recheck them, you should recheck your downloaded file to see if they are in good shape. If you are sure that your setup isn’t corrupted or if you feel your setup file size is too huge it doesn’t worth trying to re-download, proceed to the following fixes. The error message also indicates that the specific dll file is missing while trying to extract your setup. If this specific dll file is missing at the first place, the error would occur at the beginning of the setup, and thus this solution may fix your problem, otherwise we would still recommend re-downloading your file if the error pops up in the middle of the installation but not the beginning. 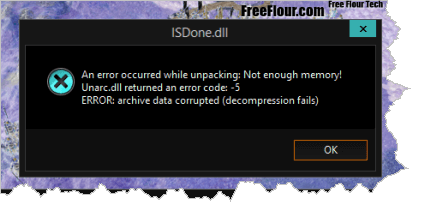 Depending on what the actual error message or code is telling you, if it’s the ISDone.dll that is missing from your system file, search it on Google or dll-files.com, download and replace it in your C:\Windows\System32 folder. Be sure to unzip before pasting it otherwise it won’t work, obviously. You can also try pasting it into your game setup installation directory. Some users reported that this actually fixed the error. The error may also occur if you have insufficient hard disk space for your installation and thus causing it to stop in the middle of the installation. Double check if you have enough and that your installation directory is correctly pointed to the HDD that have sufficient place for your game installation. A few users also reported that replacing their faulty memory RAM solves the problem. Check if yours is working fine. If none of the above solve your problem, it may be that the download source of the game setup is either originally corrupted or a fake one. Find another source. We also recommend using PC Mechanic to automatically scan and fix your Windows issues to get rid of the problem.